Here you can find a strain description about Royal Ulduz (Bald man Lala) and also some user-based reviews and infos directly from the SeedFinder (if available). You can also find the offers and auctions here if Royal Ulduz (Bald man Lala) cannabis seeds are on stock at MyCannapot right now. Royal Ulduz is made outdoor where she can be grown up to 55*N lat. Shes a sativa dominant plant with the earlyness from the indica influence. 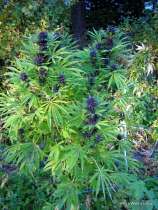 She can grow very big with lots of branches and she have a heavy odor od spicy hash, which has to be taken in account when grown near neighbours who dont like the herb. Very suitable for indoor cropping too where shes very fine in scrog set-ups. Likes to be grown organic. Royal Ulduz (Bald man Lala) is not available at our shop at the moment!